It is a well known fact that every time someone reads the ending of a book before they start – a fairy dies. I am not making this up. It is true. If you want to know more about the origins of fairies dying you must read BookThingo’s Spoiling a Happy Ending where the whole idea is explained, in depth. Readers, in general, fall into two categories – those that can’t bear to know the ending of a book, who enjoy a story unravelling around them and read in anticipation of the final moments, and then there are readere who like knowing how a book ends so that they can enjoy the journey without the page turning anxiety of needing to know if the hero and heroine will make it in the end. I am of the latter proclivity. I will read the ending, assure myself that ends in a way that satisfies me and then I will start the journey. It is particularly good for me to read reviews with *spoilers* so I don’t have to read the endings. In the case of spoilers, a fairy is only maimed. Perhaps a missing limb. I started reading the end of books at about 12 years of age. Up until then, for the most part, I had grown up reading children’s fiction which was funny, positively conclusive, life affirming and, in general, a happy read. Then I started entering the world of tear jerkers. Books where you are torn apart with grief. 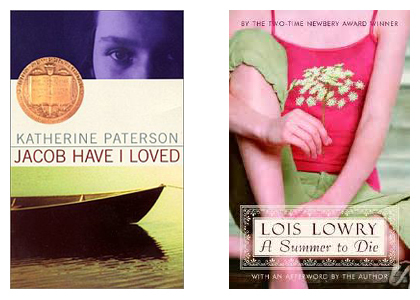 I remember sitting in Marrickville Children’s Library reading Lois Lowry’s A Summer To Die horrified that Meg’s sister Molly dies. Horrified! Firstly, I was reading and sobbing in a public space that I was not comfortable in. (That may sound odd but, in actual fact, my local library branch The Warren Library in South Marrickville had been closed down a year earlier. I no longer visited the library daily but could go only once a fortnight)…..so anyway….I’m sitting in the corner sobbing with red blotchy eyes but yet unable to stop reading a compelling, touching story. I learnt my lesson that day. I never again read a book in the library. All books were to be consumed at home. Reading was no longer public. By the time I read Katherine Paterson’s Jacob Have I Loved I became used to the idea that crying was just part of the story, as were dying people, manipulative relationships and finding your own way in life. To counter-balance these sadness filled novels I discovered the wonderful world of romance novels. And in particular, Mills and Boon. Short and contemporary, they were easy to hide in your foolscap folder so that your father couldn’t see them when he was checking that you were doing your homework. And best of all they ended happily. That is, until Anne Weale’s A Portrait for Bethany. In A Portrait for Bethany, Bethany ends up with the WRONG man. WRONG MAN! YES I AM SHOUTING! IT’S IS NEARLY 25 YEARS LATER AND I STILL HAVEN’T RECOVERED. After traumatic Bethany, I never trusted a book again. So it would have been about…ummm…let say…..25 years ago that I started reading the back page of every novel I read. I read about 100 books a year so that comes to approximately 2500 dead fairies. Now, I did slip into complacency at one stage and stopped reading the last pages of any Harlequin Mills and Boon that I purchased. They were a given Happily Ever After. Guaranteed. The “formula” said so. I was safe! (let’s quickly re-calculate that number. Perhaps drop it to 1800 dead fairies). Then disaster struck. Late last year, I purchased an auto-buy Harlequin Mills and Boon author, Lynne Graham. Now I adore Lynne Graham’s books. They have incredulous plots with engaging, emotional narratives leading the reader to be enthralled at how she manages to pull it all together. I was on the edge with The Pregnancy Shock but when it ended without closure I was horrified. I would have loved to have thrown the book at my wall but my wall has some lovely prints hanging off it so the floor had to do. How could the author, editor, publisher, marketing group, janitor and building supervisor do this to Harlequin Mills and Boon readers. How could they do this to fairies? How could they misunderstand the reasons that any woman will tolerate those awful titles and mostly stupid covers is because the HEA is king. Forget Content is King. HEA is the absolute rule here. As romance readers, we will tolerate awful plots, shocking phrases (I’m looking at you Miss Paullina “she looked up at his face but it was as closed as a bank on a public holiday” Simons), ludicrous premises and sometimes Alpha-Brutes that you wouldn’t let approach you with a ten-foot barge pole. We readers will put up with all that for an HEA. (Please Note: most romances are beautiful, brilliant, well constructed , wonderfully researched, emotionally charged and full of snappy dialogue that would make Al Jaffee proud). 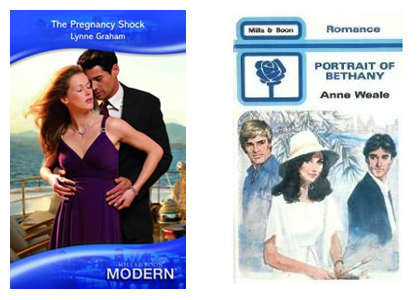 The thing is that since The Pregnancy Shock I now distrust Harlequin Mills and Boon again. I now read their back pages just as I read the back pages of all novels. And sadly, I have come across several that end in an “…there’s more to come” way. And even more sadly, more fairies are dying than needs to be the case. PS. Should you be a fairy killer and use twitter, remember to use #afairydies. I’m a fairy killer! There have been a couple of times where I kind of wish I hadn’t because something on the very last page changed the whole story – for example, the end of My Sister’s Keeper by Jodi Picoult pretty much makes the rest of the book irrelevant! A book or movie or anything is ruined for me if I even get an inkling of the ending. I cannot read or watch anything out of sequence either. If you think I am bad I knew an actuary once who didn’t read living authors – her logic was that if they died mid-series she would hate it. I assume from what you’ve written that you know that Lynne Graham novel wrote a sequel which completed the story. I went over to her website to find out the details and, to my dismay, I discovered that there’s another “Linked-Story Duet” coming out from her in 2011. Have you come across others that they’re publishing in two parts like this? I’m not keen on the idea at all, because it’s not fair to people who pick up the novel expecting to get the usual romance story-arc and instead only get part of one. If the whole story is too long to fit in the shorter length required for that line, why couldn’t they publish it as a single-title romance? @ Laura Vivanco: Yes, I went out and bought A Stormy Greek Marriage as soon as it was released but I can’t bring myself to read it. I ve concluded that it’s due to not having signed up to read a 360 page novel. I love the short, intense read that categories provide. I agree that it should have been published as a single-title romance. I haven’t yet come across any other two part titles in the series other than Lynne Graham’s (sadly, I’ve chosen to not read her titles anymore as I had come across her Linked-Story duet). I’m making a wild guess here but I think that this may be part of the re-branding/marketing exercise that M&B has been going through and they have chosen to experiment with the HEA “formula”. If this is a case, it is another indication of the disdain the marketing arm of M&B hold their readers. Perhaps they feel that if they experiment with one of the more successful, established authors they can see if sales drop or continue. As I said, this is a wild guess and I hope it isn’t the case. What killed both the Lynne Graham duets for me was that there was infidelity by the hero in both. The Penny Jordan duet released around the same time did not involve any infidelity and could be read without that sense of incompleteness..